Your commercial property could benefit from the numerous reasons to install louvers. 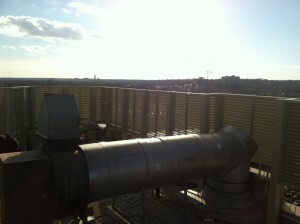 More and more commercial properties are choosing to install commercial louvers. If you have any concerns regarding security or access to your property, louvers are often a great option. You may not have heard of louvers before—they’re a kind of slatted fence that allows for the transfer of air and keeps a space from feeling like it’s indoors while still offering big security and privacy benefits. Louvers have their own unique benefits that can’t be matched by typical fences, but are they right for you? Let’s take a look at three reasons commercial properties can benefit from louvers. Sometimes, you need to put up physical barriers to separate your business from the surrounding areas. This is especially true in mixed developments where you may not know who is snooping around at odd hours and trying to spy on your commercial property. Privacy is a big deal for many business owners, whether they have clientele that don’t want their business out in the world or if they want to obscure the work they’re doing. Louvers work well for privacy because they obscure an area much better than traditional fences would without completely closing an area off. Concerned about security on your commercial property? Worried that someone may end up where they’re not meant to be? Commercial louvers are a fantastic option in keeping out the riff raff. They’re incredibly difficult to scale or circumvent, but still offer a breathable outdoor area that feels like it’s outside rather than in. Louvers also significantly obscure the line of sight, making it much more difficult for potential criminals to know what you’re keeping behind closed doors. If you’re looking to secure your property, commercial louvers are a fantastic option that can work for many different applications. There may be instances where you want to allow access to certain areas for certain employees while making it clear to others that they aren’t meant to be in that place. Physical barriers are some of the best ways of clearly indicating to people where they can and can’t be, and louvers are no different in that regard. Louvers are a great way of offsetting an area and making it much more restricted in terms of access. This entry was posted on Friday, January 18th, 2019	at 5:11 pm	. You can follow any responses to this entry through the RSS 2.0 feed. Both comments and pings are currently closed.